Displays a modal dialog the enables the caller to search and select one or more users from Content Studio. This component is typically used when there is a need to let a visitor search and select one of more Content Studio user. This component is similar to the AD Object Picker component but only works with users that are registered in Content Studio. The selection can be limited to a list of users and optionally a list of groups, only users in a certain group or any user. When searching users a maximum number of 20 hits are accepted with each search query. The default name of the dialog is dlgUser. If you have specified another name this name will be used in the names and id of the INPUT elements above. 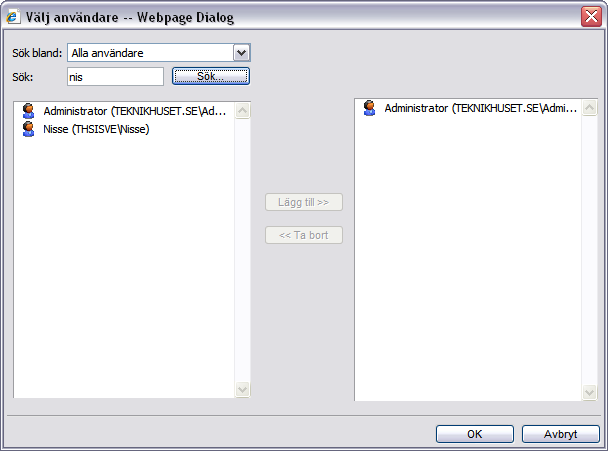 Description: Displays a modal dialog the enables the caller to search and select one or more users from Content Studio. The selection can be limited to a list of users and optionally a list of groups, only users in a certain group or any user. When searching users a maximum number of 20 hits are accepted with each search query. This dialog is initialized on the client side and cannot be used on anonymous sites. Since it uses the Microsoft DOM parser it can only be used in Microsoft Internet Explorer on the PC platform. Name: variable name A string that unique identifies the dialog within the page. If you have more that one component on a page this value must be different. Only the letters A-Z, number and _ (underscore) are permitted and you must supply a name. DialogTitle: variable name The text displayed in the title bar of the dialog. Leave this argument blank to let Content Studio to decide a proper title. RestrictiveData: variable name The name of a security group or a semicolon separated list of groups the caller can select from. The group names must be in the form DOMAIN\GROUPNAME as it appears in the list of groups in Content Studio ex. BUILTIN\Administrators. If this argument is empty and the "Select from the supplied groups only" SelectLevel is applied no group filter is applied and all users can be selected. UserList: variable name A list of user id:s or SID:s that forms the list of users that the caller is allowed to select from. Used with the "Select from a user list only" option only. The individual items in the list should be separated by semicolon or comma. This list can be combined with one or more group names in the RestrictiveData parameter. SelectLevel: Type of data that the user can select from. "All Users" can select among all users. If one or more group names are specified in the RestrictiveData argument these groups are listed as well. "Select from the supplied group only" can select users from any of the groups specified in the RestrictiveData argument. "Only select from a list of users" only users specified in the UserList argument are allowed. If one or more group names are specified in the RestrictiveData argument these groups are listed as well. SingleSelect Forces the dialog to use single select. Check this if you would like that only one user can be selected. Width: The width (in pixels) of the dialog. Recommended width is 600 px. Height: The height (in pixels) of the dialog. Recommended width is 400 px. Attributes: variable name Optional attributes in text field. This parameter can be left empty. ClassName: (klass) The name of a CSS class that should be applied to the text box of the component. This parameter can be left empty. ButtonClassName: (klass) The name of a CSS class that should be applied to the browse and delete buttons. This parameter can be left empty. BrowseText: variable name Text of the button displayed that shows the dialog. DeleteText: variable name Text of the delete button that shows next to the browse button. A string that unique identifies the dialog within the page. If you have more that one component on a page this value must be different. Only the letters A-Z, number and _ (underscore) are permitted and you must supply a name. The text displayed in the title bar of the dialog. Leave this argument blank to let Content Studio to decide a proper title. The name of a security group or a semicolon separated list of groups the caller can select from. The group names must be in the form DOMAIN\GROUPNAME as it appears in the list of groups in Content Studio ex. BUILTIN\Administrators. If this argument is empty and the "Select from the supplied groups only" SelectLevel is applied no group filter is applied and all users can be selected. A list of user id:s or SID:s that forms the list of users that the caller is allowed to select from. Used with the "Select from a user list only" option only. The individual items in the list should be separated by semicolon or comma. This list can be combined with one or more group names in the RestrictiveData parameter. Type of data that the user can select from. "All Users" can select among all users. If one or more group names are specified in the RestrictiveData argument these groups are listed as well. "Select from the supplied group only" can select users from any of the groups specified in the RestrictiveData argument. "Only select from a list of users" only users specified in the UserList argument are allowed. If one or more group names are specified in the RestrictiveData argument these groups are listed as well. Forces the dialog to use single select. Check this if you would like that only one user can be selected. The width (in pixels) of the dialog. Recommended width is 600 px. The height (in pixels) of the dialog. Recommended width is 400 px. Optional attributes in text field. This parameter can be left empty. The name of a CSS class that should be applied to the text box of the component. This parameter can be left empty. The name of a CSS class that should be applied to the browse and delete buttons. This parameter can be left empty. Text of the button displayed that shows the dialog. Text of the delete button that shows next to the browse button.